The Lower Modernisms – 063. 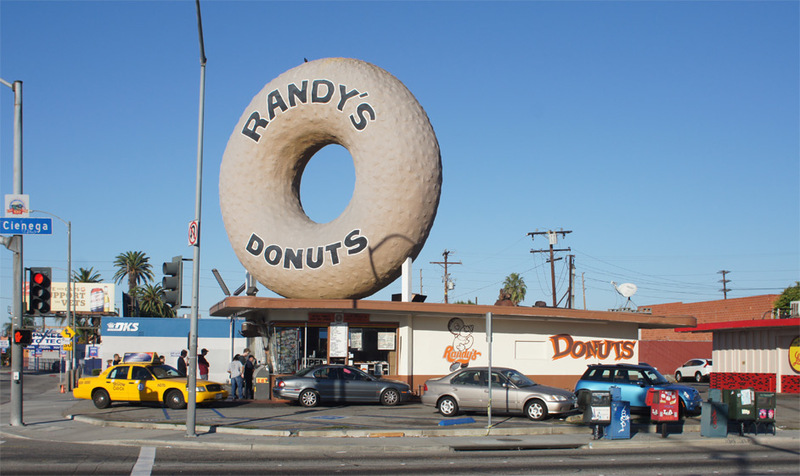 The Giant Donuts of Los Angeles. Lomo Building Types. Bicycle Tour. May 14, 2016 by James Black. 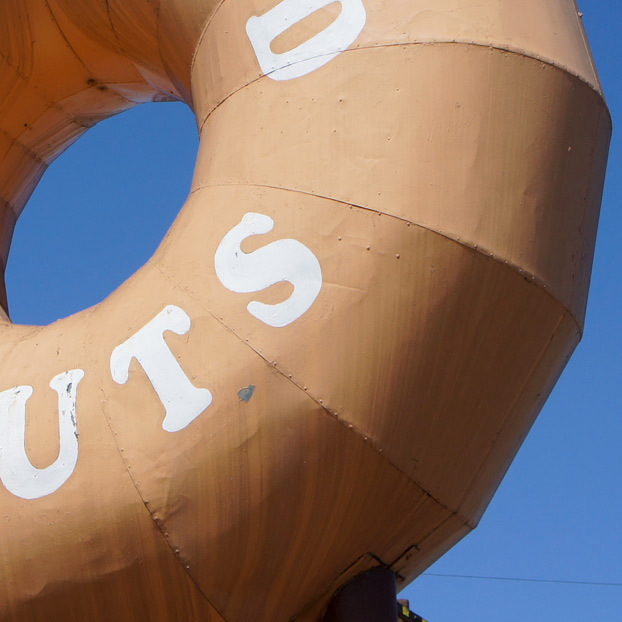 The Giant Donuts of Los Angeles Bicycle Tour took place on March 6, 2016. 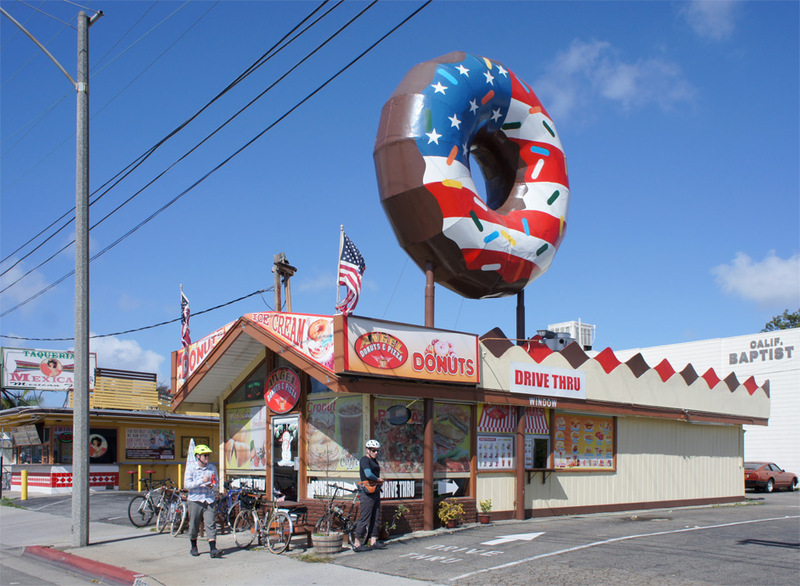 Seven of us embarked on the challenge of riding a 55-mile loop through southeastern Los Angeles County with stops at eight of the ten extant donut shops that integrate giant donuts into their architecture. 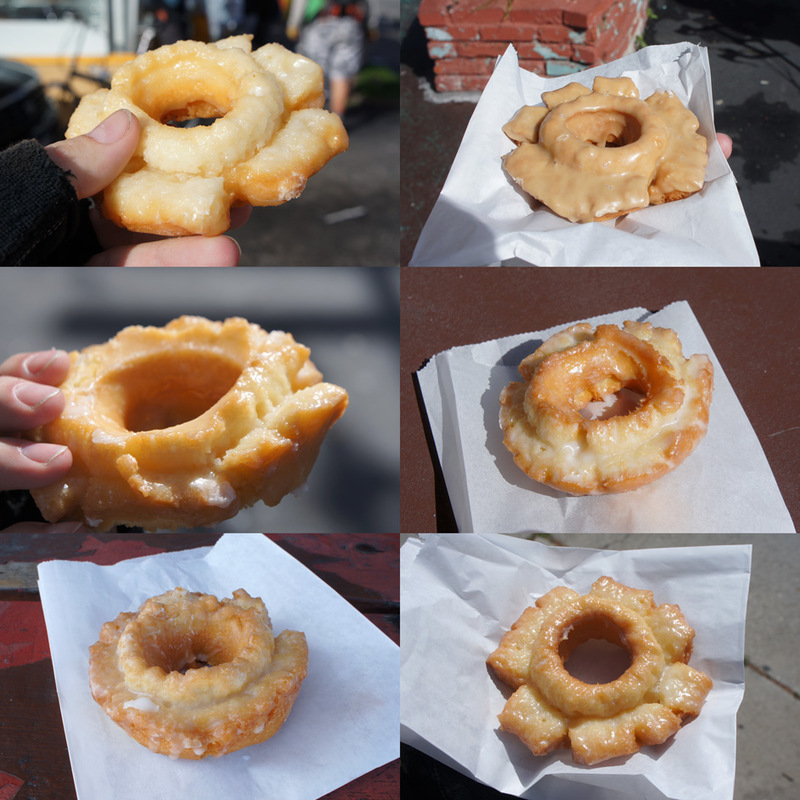 Six of us completed the ride, but none of us could complete the greater challenge of eating all eight donuts. Where possible my selections hewed to the old-fashioned glazed, the monarch of the baking powder-leavened cake donut kingdom. Although it eschews the platonic torus shape seen on the giant rooftop donuts, this starchy power ring’s objective superiority rests in the high ratio of surface area to volume engendered by its wrinkly shape. 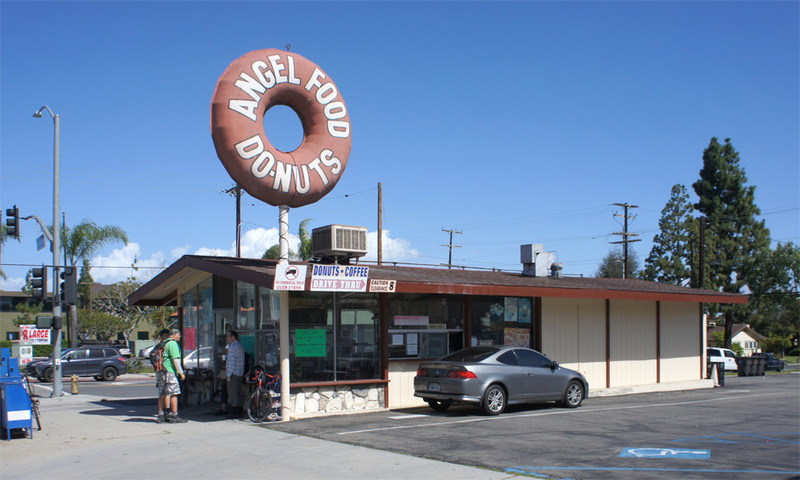 Of the ten extant giant donuts, five (including Randy’s Donuts) are of the Big Do-nut Drive-In pattern; four, scattered around the Long Beach area, are of the Angel Food Donuts pattern; and the last, unique for its configuration wherein the customer drives through the donut itself, is the Donut Hole in La Puente. The Donut Hole will be the object of a separate bicycle ride. 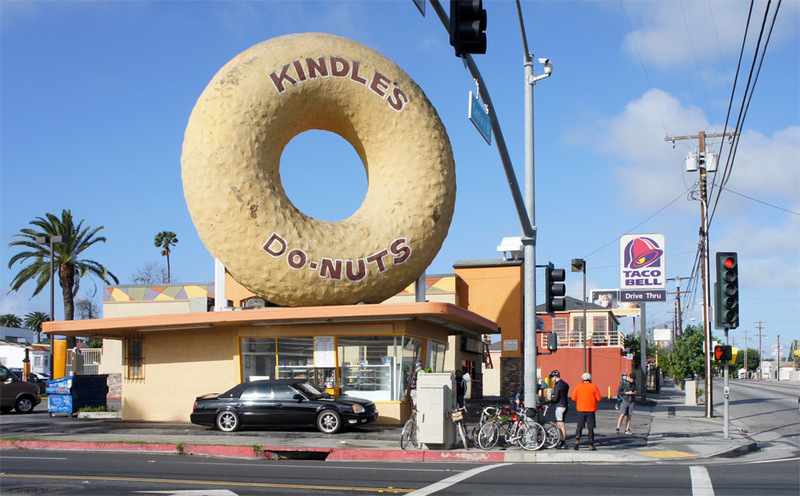 Our first stop was Kindle’s Donuts at 10003 Normandie Avenue in the unincorporated Westmont neighborhood of South Los Angeles. 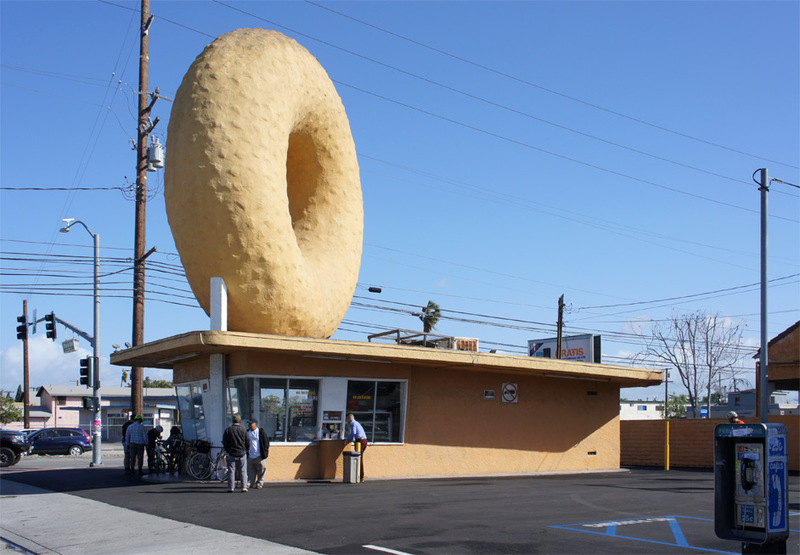 The building typifies the architecture of the Big Do-nut Drive-In chain; a simple rectangular stand minimally adorned with canted stucco walls, strip windows, and a cantilevered, low-slope shed roof topped by a gunite donut held aloft on two steel posts that penetrate the roof. Constructed in the early 1950s, this design is attributed to architect Henry Goodwin, as well as the great structural engineer Richard Bradshaw, designer of the Theme Building at LAX; to his credit, never has a seismic event or tornado caused any giant donut to roll down the 405 or otherwise wreak havoc. 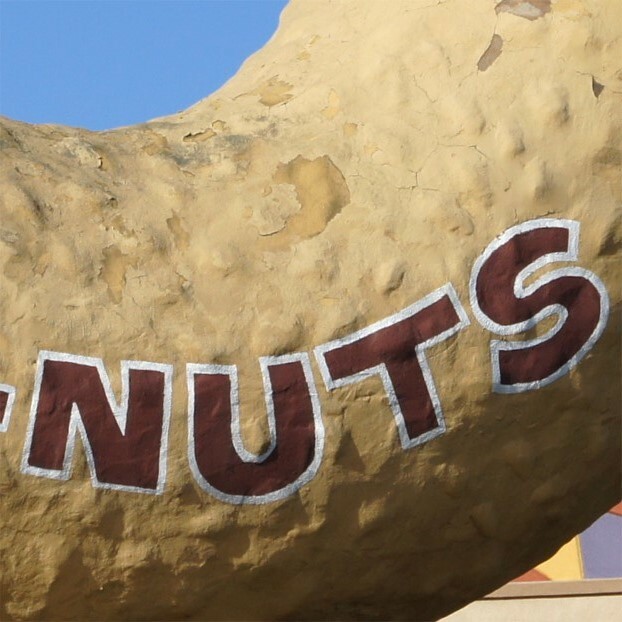 The gunite application on the donut, as is typical with the Big Do-Nut chain, was enhanced with an appetizingly bumpy texture. Quite possibly because this was my breakfast and I was not yet nauseated from overconsumption, I thought Kindle’s offered the best donuts of the day. 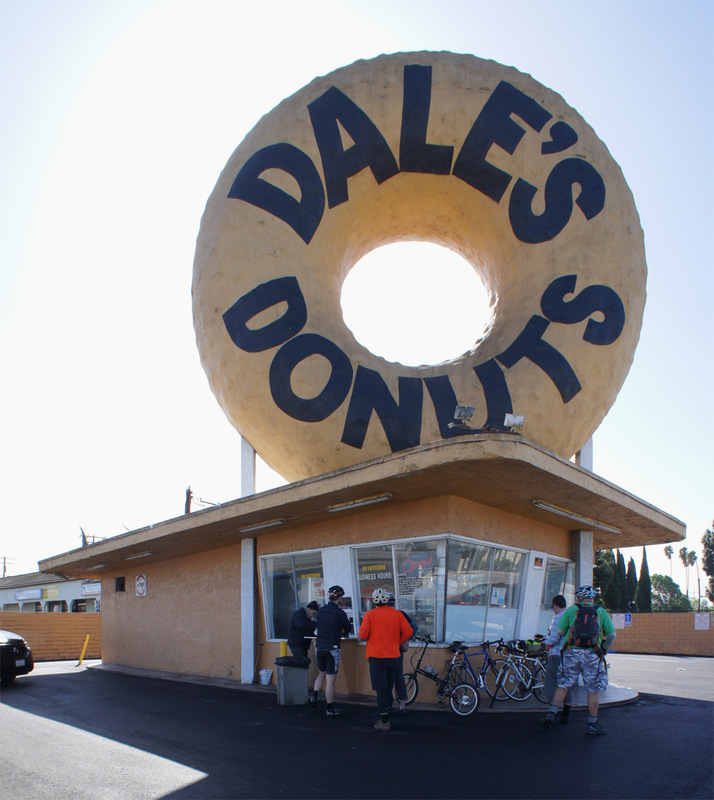 Second stop was Dale’s Donuts, at 15904 Atlantic Avenue in Compton. Also constructed originally as a Big Do-nut Drive-In, Dale’s key difference from Kindle’s is that the posts holding up the donut are expressed outside the building as freestanding columns that penetrate the roof; at Kindle’s the posts land within the exterior walls. The letters on the donut strike a different tone. 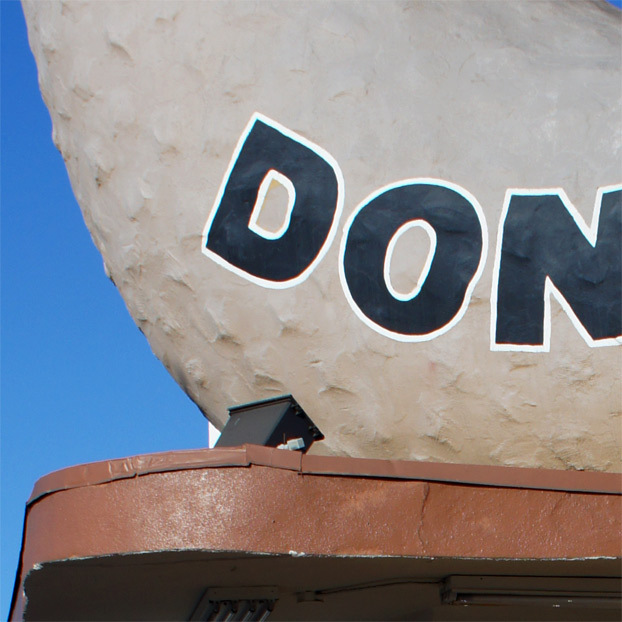 The use of the same paint color on both donut and donut stand unifies the composition and begs the observer to compare and contrast the two similarly scaled elements. The backside was conveniently left blank, to facilitate your efforts to photoshop your own name or slogan onto a giant donut. 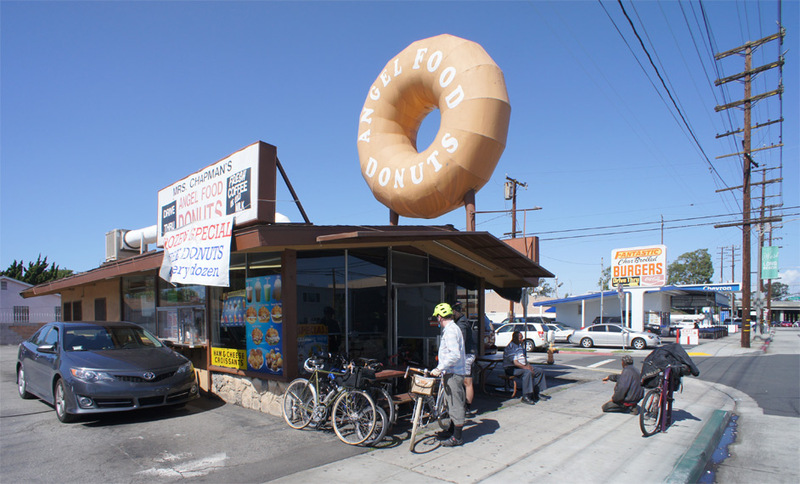 The third stop, Bellflower Bagels at 17025 Bellflower Boulevard, was also built for the Big Do-nut chain, but we observe further differences – the donut is held aloft on a single post positioned just outboard of the roof; and the roof is nearly flat. 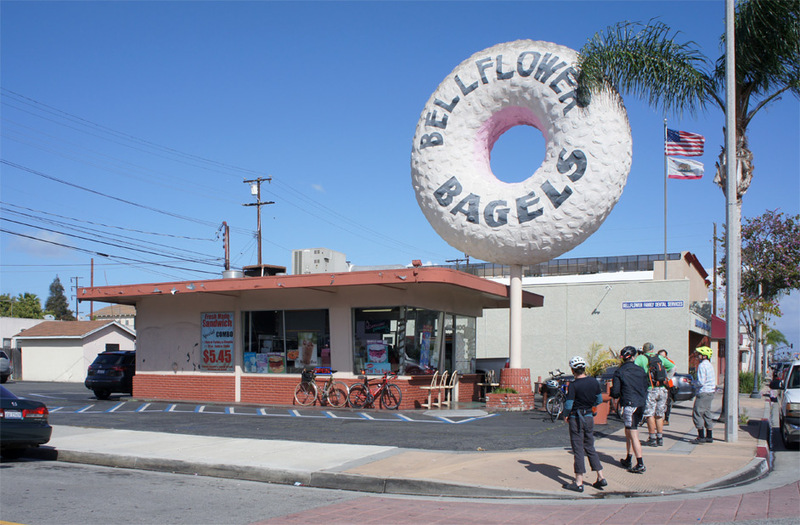 Unlike the other four remaining ex-Big Do-nuts that are true “stands” wherein the customer stands outside at a window to order, Bellflower Bagels serves from inside, and even offers a couple of tables and seats. This giant donut has an indexical haircut – it would appear that some parts of the donut are not so easy for a less ambitious painter to reach. The fourth stop brought us to Long Beach, the home turf of the competing Mrs. Chapman’s Angel Food Donuts chain. Only three locations remain in operation; at a fourth location on 7th Street, the carpetbagging and despised Dunkin’ Donuts corporation knocked down the building, but bowed to community pressure and maintained the donut sign itself. The staff was most friendly at the Angel Food Donuts outpost at 1907 East Carson Street; the exterior graphics, most patriotic. The location at 3860 Long Beach Boulevard remains truer to its original appearance. 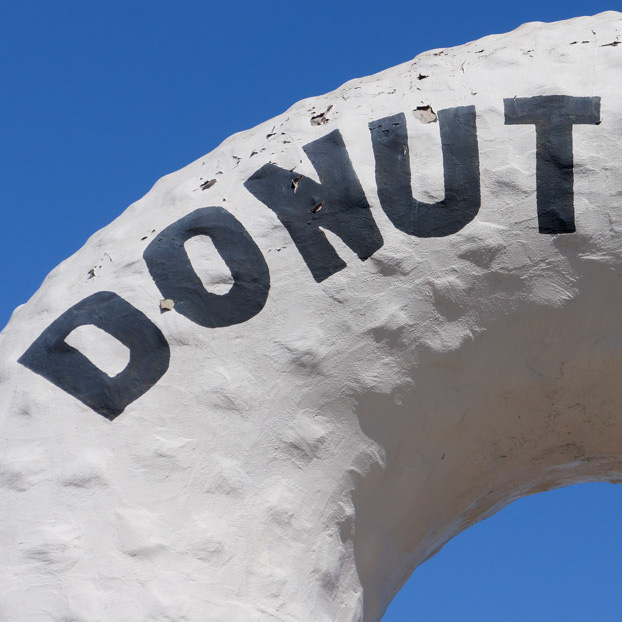 A smaller donut is held aloft on a single post penetrating the gabled roof, the profile of which, combined with the Palos Verdes rock cladding and exterior wood siding and battens, gives this building something of the character of a Mid-Century Modern ranch house. 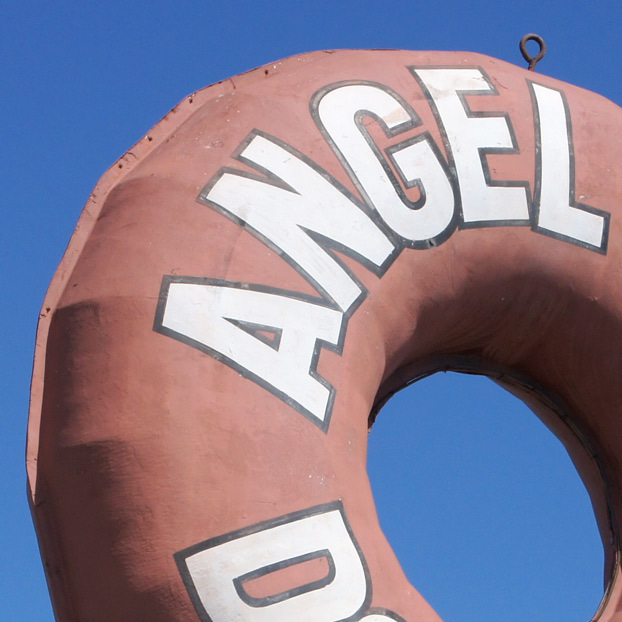 The Angel Food giant donuts are faceted, and I could not confirm the fabrication of this one – perhaps a cement-plaster skim coat over a sheet-metal body. The sunny interior looks like a Modernist space with its full-height glazing stopped directly to the post-and-beam framing. Our sixth stop at another Angel Food location, at 3657 Santa Fe Avenue, found a similar architecture, also pretty well preserved but festooned with signage. The giant donut here is clearly formed of riveted or screwed sheet metal. The flow lines of rainwater have drawn dirty striations according to mathematical logic. 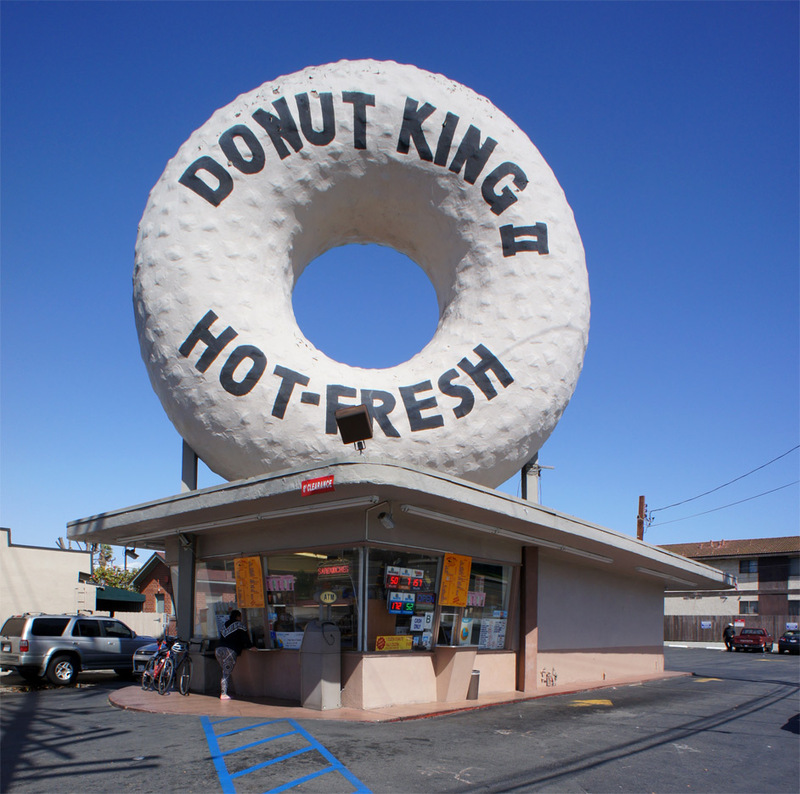 Stop number seven returned us to the familiar Big Donut pattern at Donut King II at 15032 South Western Avenue in Gardena. 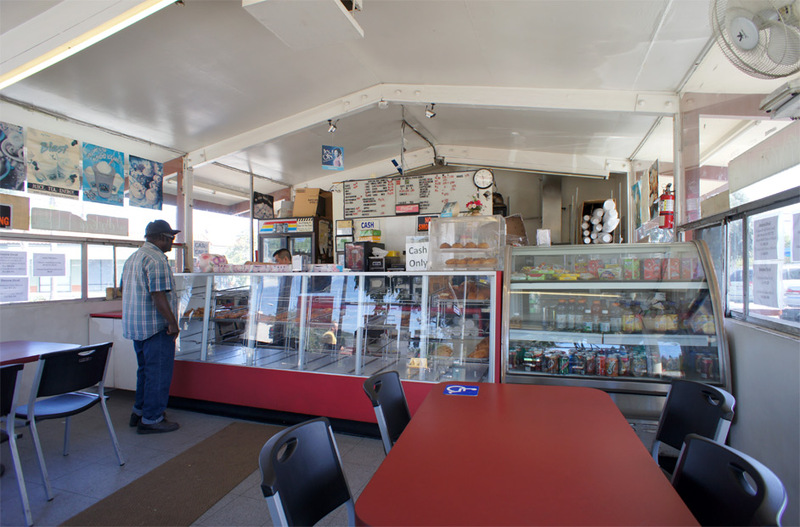 Like Randy’s and Dale’s, this shop was constructed with a shallow-slope shed roof and the donut’s supporting posts outboard of the exterior walls. Pocked and peeling paint reveals warmer tones beneath, like incomplete frosting. Our final stop, Randy’s Donuts, an Inglewood landmark at 805 West Manchester Boulevard, was the only donut stand where we found a crowd, despite their offering the most expensive and least spectacular donuts of the day. I urge fans of Randy’s to branch out and explore the giant donut competition. But Randy’s certainly looks great. The colors are tasteful, and the lettering nicely outlined.